Part of (ok, most of) the fun of traveling is trying new restaurants. Here in Hamilton County, we have a long lineup of bold tastemakers changing the local dining landscape. If you&apos;ve never tried a traditional Moroccan breakfast dish, pirate/barbeque fusion or coffee cake with its own Twitter handle, you&apos;re going to like what Hamilton County has on the menu. 5 "must try" dishes await your order. It&apos;s rich. It&apos;s tomato-y. It&apos;s spicy. And it&apos;s...for breakfast? 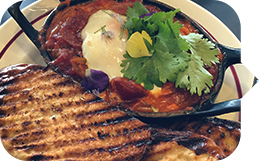 Eggshell Bistro in Carmel City Center shakes up the status quo with a menu of globally-inspired brunch items, including the Moroccan shakshuka. Food and Wine Magazine agrees that this dish is as pretty as it is tasty. Back in the day, pirates used a meat preparation technique known as "barbacoa" to feed their crews. Today, Big Hoffa&apos;s infuses their fall-off-the-bone barbecue with pirate culture. 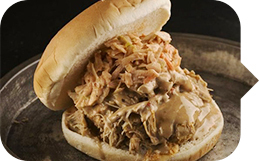 The Marley, a pulled chicken sandwich topped with homemade Caribbean white barbecue sauce and spicy habanero coleslaw, is a treasure trove of spicy and sweet flavor profiles. 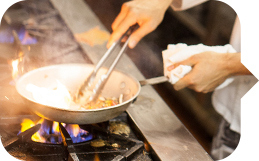 Taste why Honest Cooking calls Big Hoffa&apos;s one of the best in the Midwest! 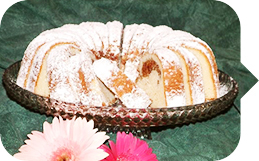 The denser-than-it-looks coffeecake has been a favorite with locals for decades. The powdered sugar topping and crunchy walnut center are perfect additions to the ever-moist cake. Around Christmastime, the Sahm&apos;s restaurant network receives more than 30,000 orders from all over the continental United States. 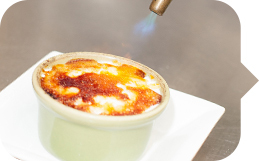 If there&apos;s one dish on divvy&apos;s 100+ item menu to try, it&apos;s the corn crème Brulee. Sink a spoon through the blowtorched, caramelized crust into the creamy concoction of corn with Romano cheese, sea salt and a hint of jalapeno and prepare for a trip to flavor town. Insider tip: order a basket of grilled rustic bread to turn the corn crème Brulee into a dip! Taste the authentic flavors of Matteo DiRosa&apos;s hometown of Salerno, Italy in every bite of this decadent dish. Ricotta cheese stuffed tortellini in a cream sauce pair perfectly with ham, mushrooms, onion and Parmesan cheese. Homemade bread is an added bonus to the meal!